Now we “compile” our design as usual. 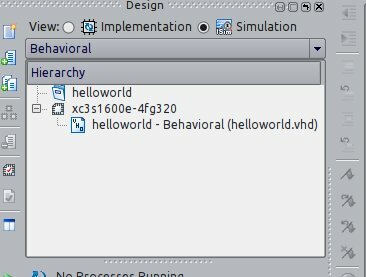 First we select in Hierarchy our helloworld entity and click first in Behavioral Check Syntax and then Simulate Behavioral Model. 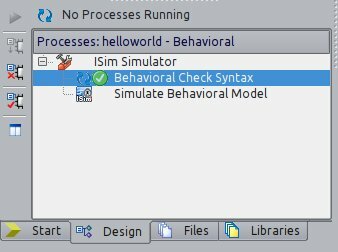 After click in Simulate, a new program will be launch – ISim.We’ll have all signals defined in our design there. We select all signals and we add them to wave window. We can drag and drop them or right clicking all selected signals and selection Add to wave window. We need to create our clock signal by right-clicking in clk signal and selecting Force Clock. In our case 50MHz has a 20ns period. We set our updown to 0 first and then to 1 to see what happens. 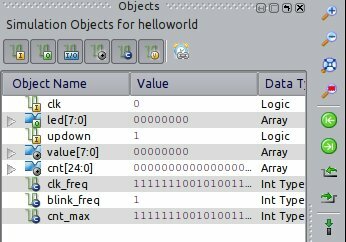 Here I also changed blink_freq to 1000000 to be able to show you the results (1 Hz is an eternity for our FPGA). Click in run and that’s it! We can see that we’re decreasing our led value when updown = 0 and increasing when updown = 1. The updown value changes in the blue cursor. Next post, I’ll show how to configurate our FPGA and finally see our leds blink!